John Z must know. Merry Christmas Tim. Merry Christmas Tim. See you down under in January. My Daughter is spending the holidays in Queensland at the Great Barrier Reef. Merry Christmas Todd & Family. All the best in 2013 and hopefully a lot of work on those Camaros! Now go get busy! After the Holidays of course. Oh yea! Thanks... Turning 40 this Friday, so I better get crackin'. I've heard the body starts to "fall apart" from 40 on... Going to get as much work done as possible this vacation before my wife goes back to work-- believe me. Progress is slow. I think the underside is winning. This is a long painful process and progress is measured in inches. As I inch my way towards the front of the car. The routine is: Use the heat gun and scrapper, followed by a wipe down with lacquer thinner, then use various drill bits and or Dremel bits to get to rust areas I can't reach with the scrapper or thinner. Original underside paint. 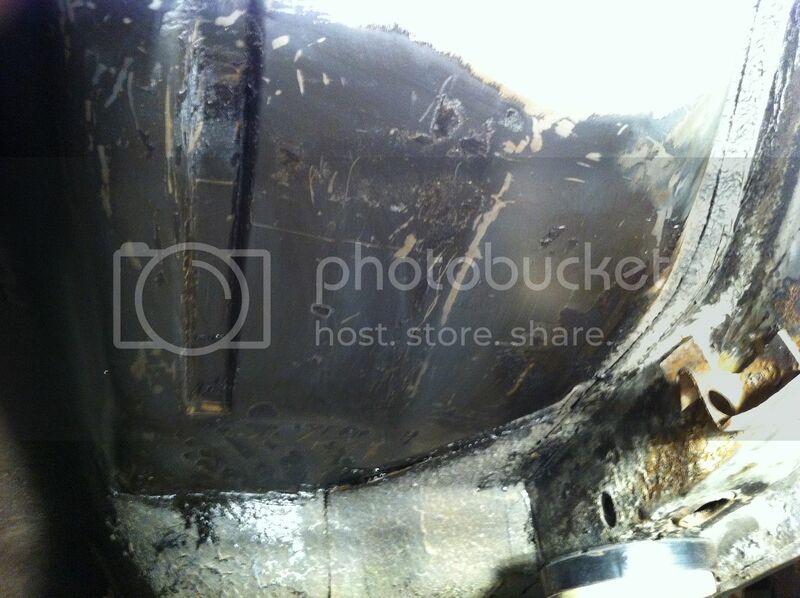 It appears that the entire underside was painted a semi-gloss black. What I thought was grey primer is actually white overspray on top of the black base coat. Does this mean the entire car was painted black? Was it primer, or was only the underside painted black? 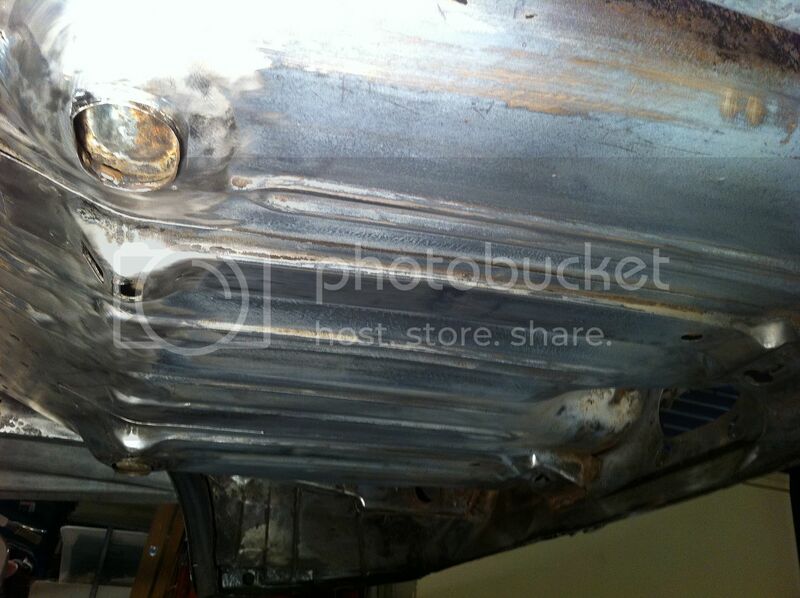 Frame Rails are in good shape as is everywhere under the under-coating. However there were some places that the under-coat missed, and those places have surface rust. This area has the worst of the rust I have discovered so far. The rust comes off with the trusty Dremel tool and a stone bit. 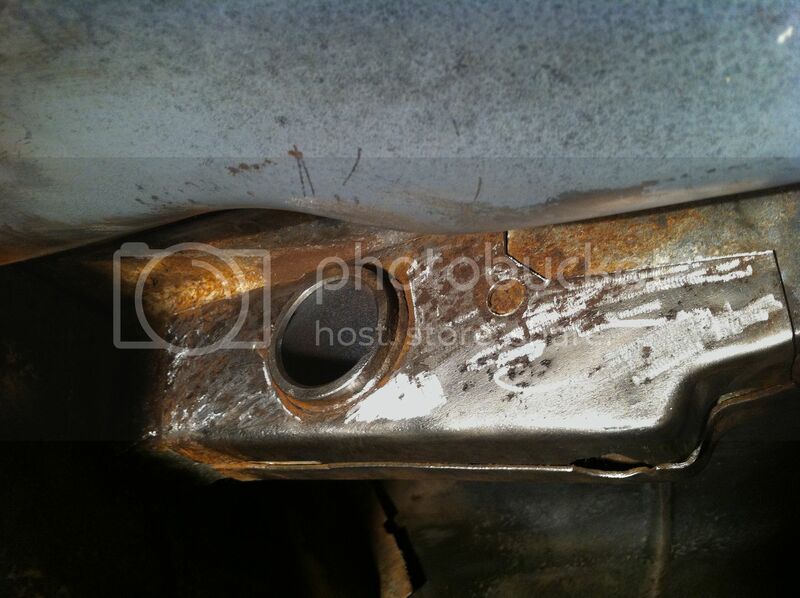 This area also has surface rust. 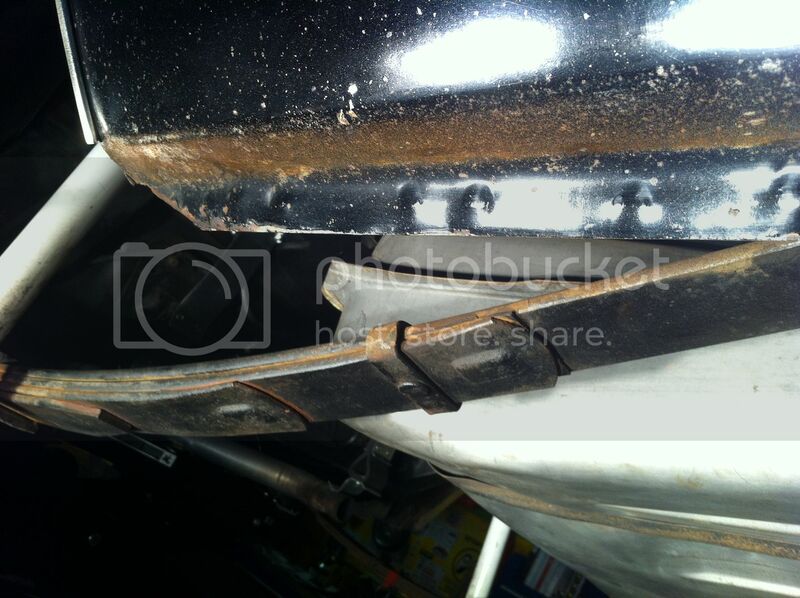 Notice the flap hole on the rocker panel. I had never noticed this before. Not quite at the half way point yet. 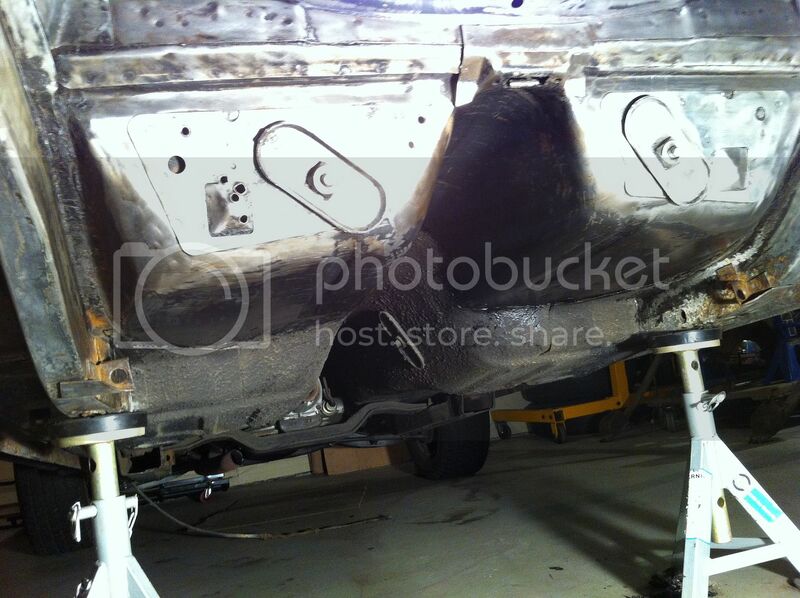 Here are all three stages, stripped to bare metal, original black paint, dealer installed undercoating. Hopefully moving forward I will be able to remove the undercoating with the heat gun and lacquer thinner only, and use less of the power tools. The grinding is the messiest part of the job and the most time consuming. As I move forward the surfaces are larger and flatter. I hope this will be reflected in the progress. Last edited by 69z28freak; Dec 29th, 12 at 10:30 PM. 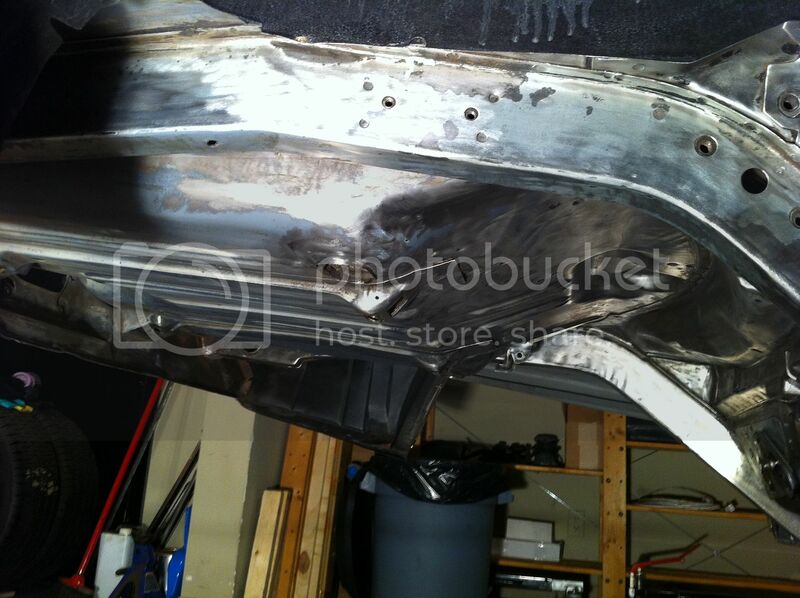 Here are some pictures of the Original Paint 69 RS Z28 I am using as a reference for my build. The Bottom of the car is also all original. 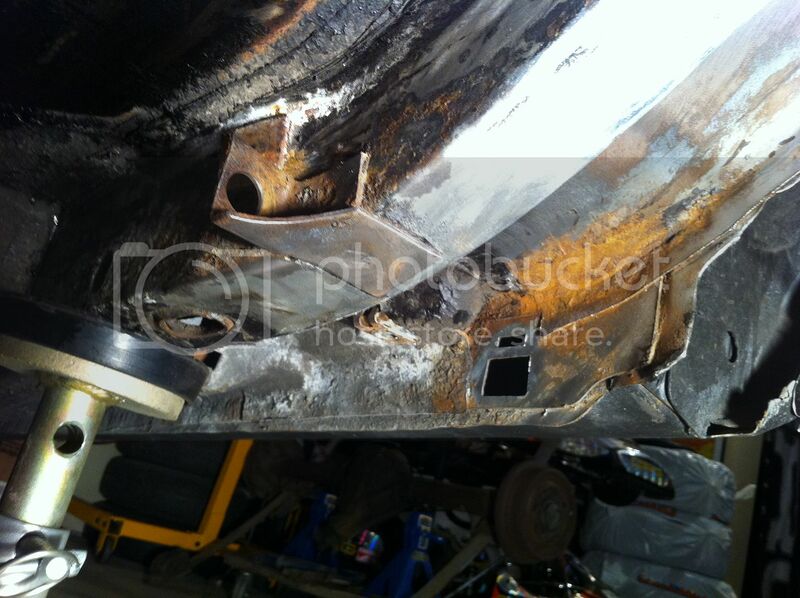 Drivers side exhaust hanger tab, welded in place. Passenger side does not have the tab, for some reason the bolts thread right into the frame rails. Holes however pre drilled in the frame rails on both sides. 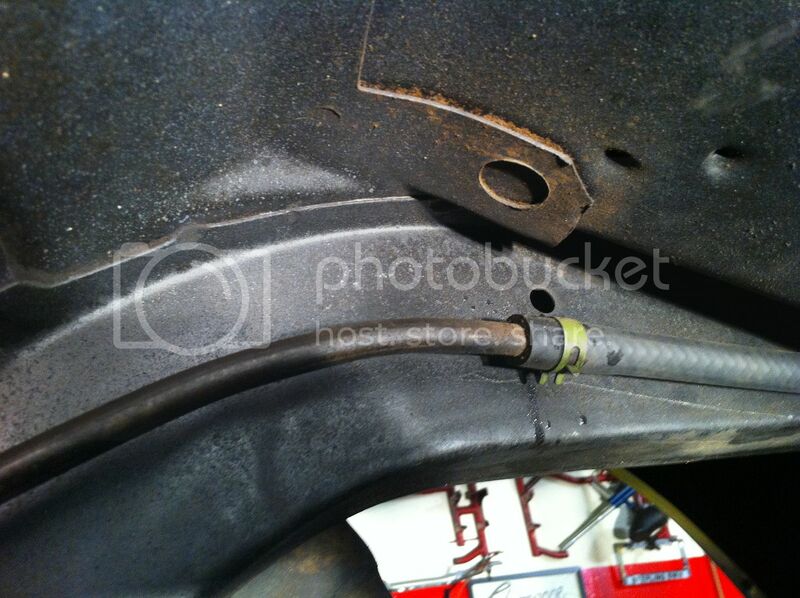 Also shows factory sound deadener sprayed onto frame rails in the wheel well. 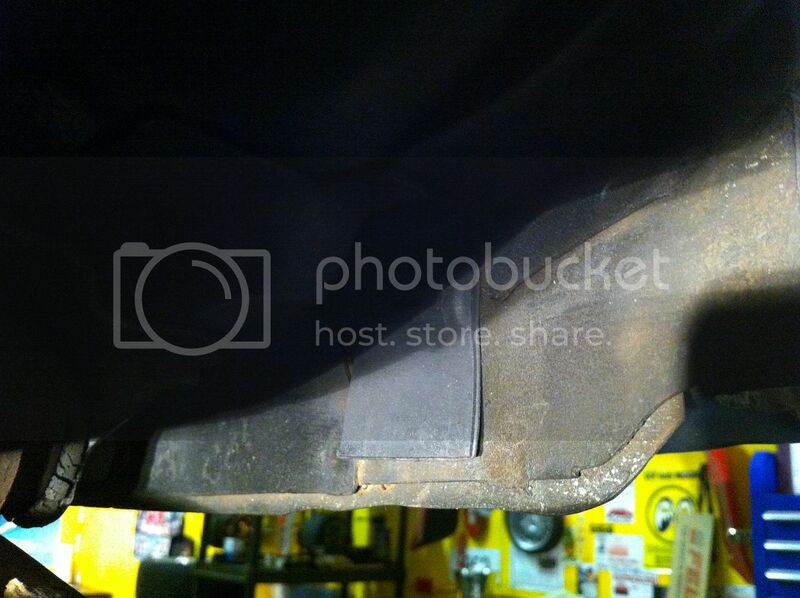 Notice Incorrect fuel line clamp. It will be changed to the correct unrounded style clamp. 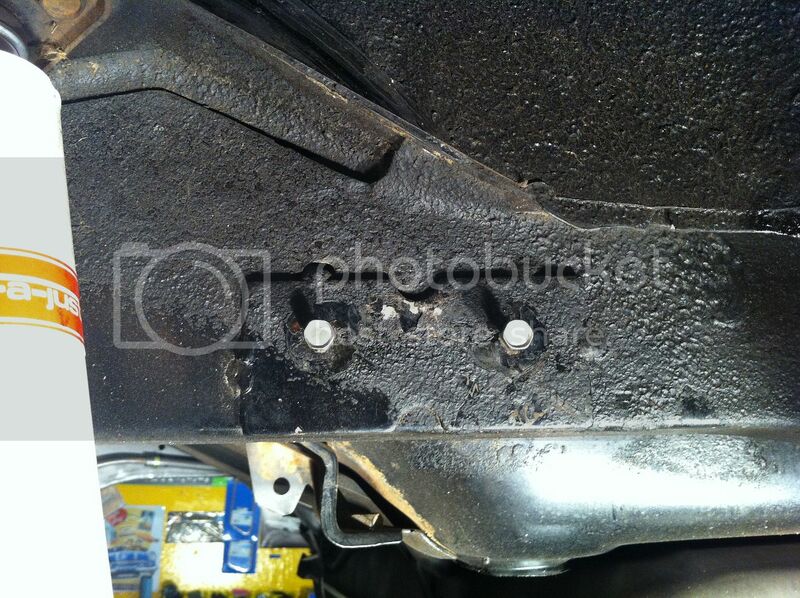 Rubber flap in rocker panel. Crusty goodness. 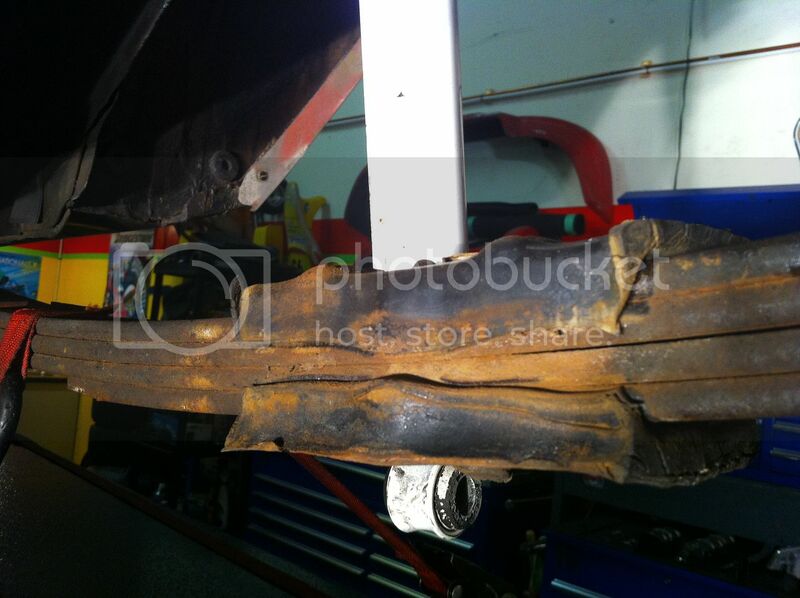 Original leaf spring rubber pads. 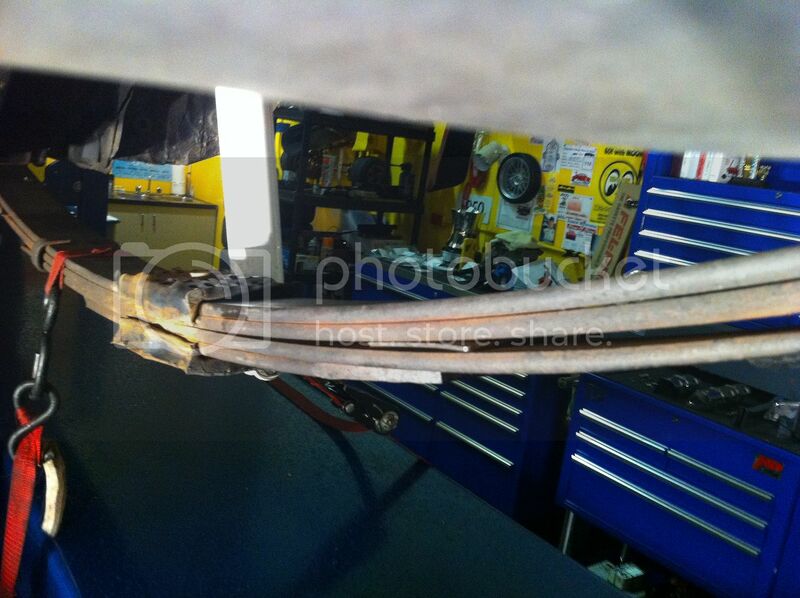 My 6 Cylinder drive shaft on the left, next to the Z 28 Drive shaft. They are the same length but have different yokes. I am please as I was prepared to have to resize mine or get a new one. 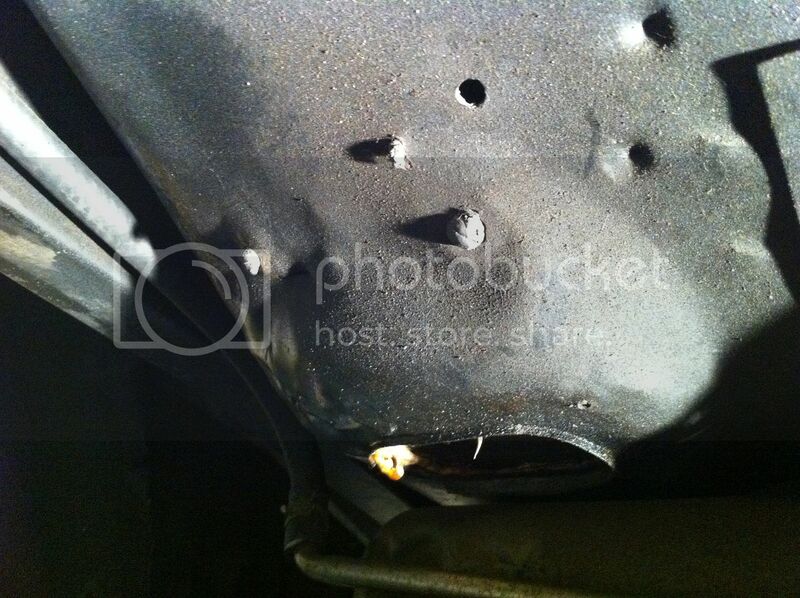 Looks like factory dum dum or sealer poking through the holes. Last edited by 69z28freak; Dec 29th, 12 at 11:29 PM. Have you run the engine yet??? Hey Tim I have not run the motor yet. I am still looking for a carb. Looking for a 780 Holley Vacuum secondaries 4053 list if possible. Everything is shut down here for the holidays. Hopefully more progress soon. Looking for a 780 Holley Vacuum secondaries 4053 list if possible. Are you looking for an assembly-line original, or a service replacement? There's a 4053 dated 941 ending in a few hours on ePay, looks pretty intact but it would need restoration or a full rebuild as a minimum. The later service replacements are usually pretty cheap compared to the factory originals, but they have a number of subtle differences, such as the thicker baseplate, straight-tube choke pull-off, etc. Obviously the date stamp is different too (4-digits compared to 3 on the assembly line versions), but only seen with the air cleaner removed. Last edited by ZLP955; Dec 30th, 12 at 02:16 AM. Thanks Todd & Happy Birthday Young Fella! 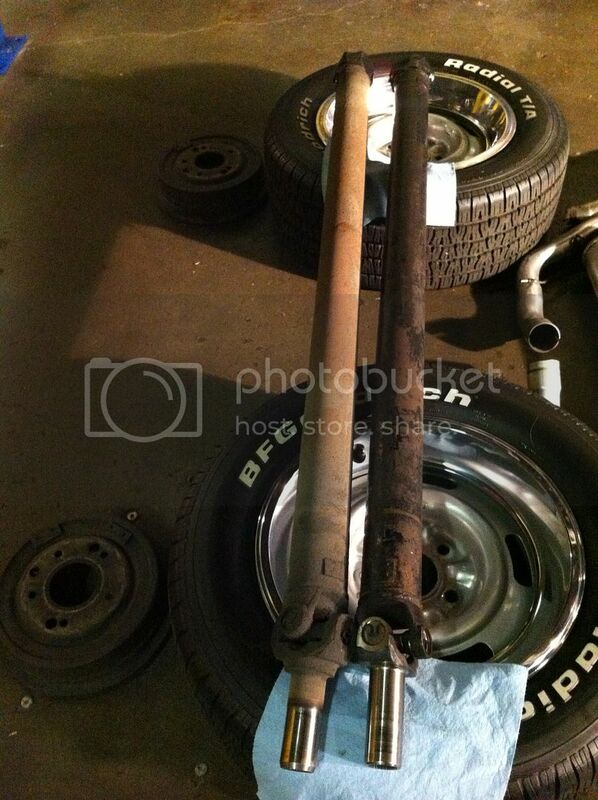 Driveshaft on the left has the "Correct" 1969 Yoke, it is the same for PG/Turbo 350 or 4 Speed. 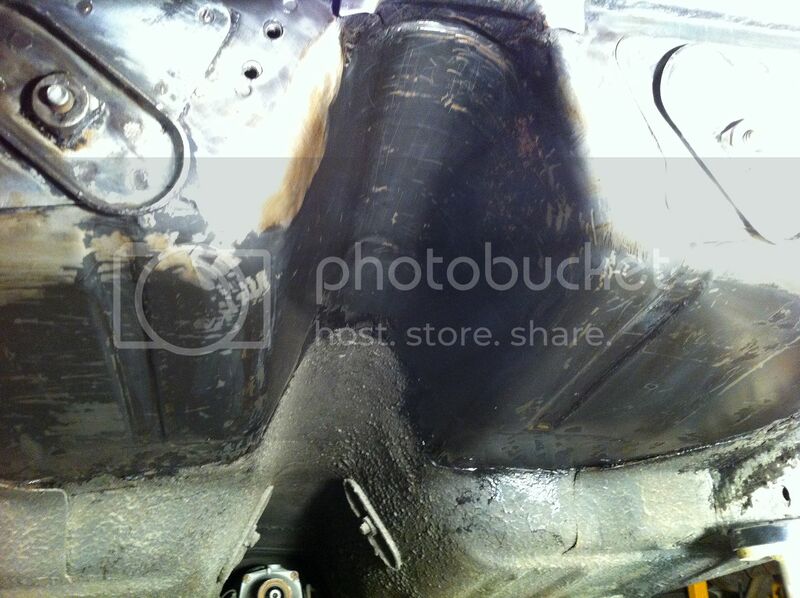 If the Z28 driveshaft is on the Rite, the Yoke is wrong, that is a 67/68 Yoke. BTW, Nice job cleaning the underside of your car! 2002 Jerry Bickle Cavalier, 446" Small Block, Brodix Canted Valve, lenco 5 speed, 7.54 @ 180. mph,1.06 60', 2235 lbs for 2014. GM Canada Docs, Highly Optioned 69 RSZ28 , Hugger Orange, White Stripes, 42,000 mile survivor, owned since 1973. My driveshaft yoke is the same as the one on the right; are you sure that's a '67-'68 yoke Mike (rszmjt)? Not something I've paid a lot of attention to before, maybe it's been replaced along the way if it isn't correct.